Wahoo's Fish Tacos is located on the first block of Main Street in Huntington Beach. Wahoo's costs a bit more but offers less oils and fats in their menu's products. 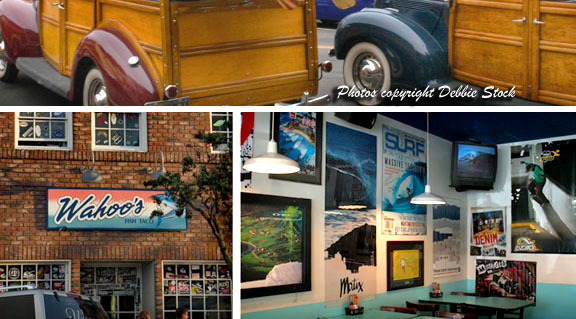 Most tourists who visit Huntington Beach enjoy the taste of the foods served at this restaurant decorated in the surfing theme. Surf boards, posters and memorabilia from surfing, skating and snowboarding fill the walls. Surf and sports videos are shown on the TV in the store. The atmosphere is incredibly casual...you can come from the beach and stop to eat in the shop. When you enter the cafe, you must walk up to a counter and order your meal and pay. You are given a number to place on your table and your food is then delivered to the table when it is ready. The soft drink bar is self serve. Wahoo's Fish Tacos restaurant serves fish tacos, chicken or beef tacos and vegetable and meat bowls, Quesadillas, Maui Onion Rings, Nachos, Taquitos, Chips & Salsa, Baja Rolls, Jumbo French Fries, salads, Chicken Tortilla Soup, Wahoo's Sandwich, Burritos, Combination Platters, beer and wine, soft drinks and Archie's Ice Cream. Wahoo's Fish Tacos was founded in 1988 in Costa Mesa by three brothers who combined Mexican, Brazilian and Asian flair to come up with a popular menu of fresh items that were both affordable and delicious. The tacos, for instance, are served with a wedge of lime and the tortillas are not cooked in oils or grease. Because of the fresh taste, it's the kind of food you can eat often. Wahoo's Fish Tacos has over 30 locations in the Western U.S. that include Nevada and Colorado and Huntington Beach, California. Most Wahoo's Fish Tacos are located in California.